I don't think there has ever been a more mismatched ODI series than the one between Pakistan and Zimbabwe that just concluded last night. Already ranked 11, Zimbabwe were further weakened by the absence of a few players resulting in them fielding a second string XI in the series. And hence the flurry of records broken and created by the Pakistanis. Weak opposition or not, I am not going to take anything away from Pakistan's young ODI team, which has grown in character by the day since that fateful Champions Trophy win a year ago. This ODI team is special. This team has reached, and I believe, will continue to reach, uncharted territory with respect to Pakistan's ODI cricket. Collectively they have not even played 100 ODIs and neither one has yet completed 50 ODIs, so it is too early to make judgments, however it is quite a feat for a nation not known to produce top quality batsmen that each one of its top 3 - Fakhar Zaman, Imam-Ul-Haq, and Babar Azam - is averaging over 50 in ODIs! And these averages are not inflated by not outs! The first ever batsman from Pakistan to average above 50 in ODIs emerged a year and a half ago. Now there are two more. 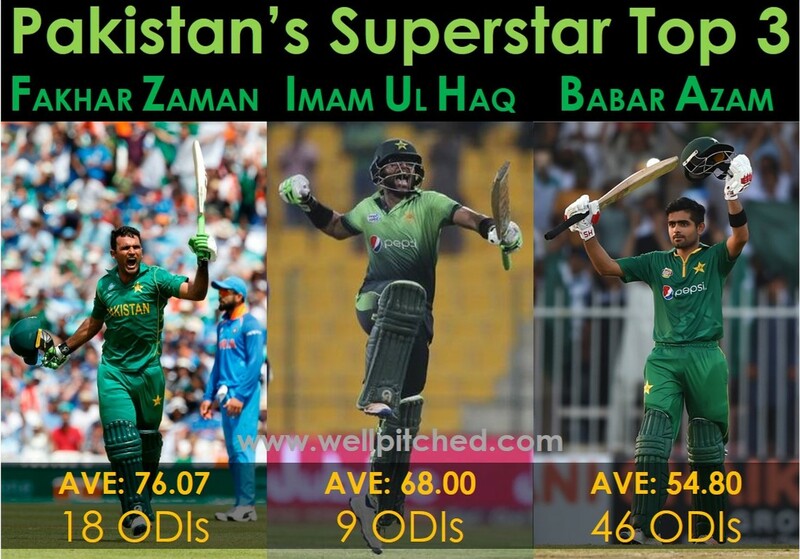 Fakhar Zaman is an absolute star! He made his ODI debut just over a year ago in the Champions Trophy 2017, which he capped with a scintillating match winning century in the final against India. He ended the ODI series against Zimbabwe with 515 runs, a new record for runs scored in a 5-match bilateral ODI series and the second highest run tally in any bilateral ODI series. During the series, Fakhar was dismissed only twice, and in between those two dismissals he amassed 455 runs, which is a record for number of runs scored in ODIs between dismissals. The previous record was also held by a Pakistan batsman, Mohammad Yousuf, who knocked 405 runs also against Zimbabwe. The third batsman to score 400 runs between 2 ODI dismissals is Lance Klusener who managed this during his dream run at the World Cup 1999. 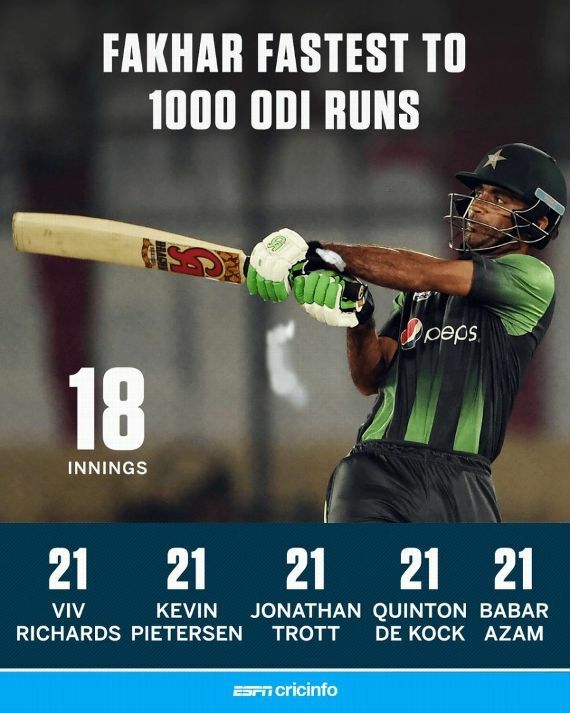 Fakhar's run spree led him to another record during the series when he reached 1,000 ODI runs and became the fastest batsman to achieve the feat in only his 18th innings. He broke the previous record of 21 innings, which was jointly held by Sir Viv Richards, Kevin Pietersen, Babar Azam, Jonathan Trott, and Quinton de Kock. Fakhar's 515 runs in the series included a record unbeaten 210, which is the highest score by a Pakistan batsman in ODIs, beating Saeed Anwar's 21 year old record of 194. His 210 was only the 8th double century in ODIs and the 5th highest score ever in ODI history. Rohit Sharma's 264, Martin Guptill's 237, Virender Sehwag's 219, and Chris Gayle's 215 sit above Fakhar's feat. He was labelled a 'parchi' given his family ties to Pakistan's chief selector Inzamam Ul Haq, but how he has thrown that label away by outclassing even his paternal uncle's ODI career launch. Inzamam made his ODI debut in late 1991 and very quickly stamped his authority in international cricket by scoring 2 centuries and 2 fifties in his first 10 ODIs. Now 26 years later, his nephew Imam, has bettered that by scoring 4 centuries in his first 9 ODIs! No one has scored this many this quick. There is only one other batsman who has scored 3 centuries in his first 10 ODIs - Dennis Amiss. Think about this - Virat Kohli and Hashim Amla, who have the best frequency of scoring 100s in ODIs, scored their 4th century in their 36th and 30th ODI respectively. While Sachin Tendulkar, who has scored more ODI centuries than anyone in the world, scored his 4th century in his 96th ODI! Imam scored his 4th in his 9th ODI! He added three tons to his tally, which also includes a debut ODI ton, during the series against Zimbabwe. I agree with most critics who feel that Imam's strike rate requires improvement and that he is not a modern day ODI batsman and may be better suited to test cricket. However, I also feel that 4 centuries in 9 ODIs cannot be ignored and that he is probably the best foil to Fakhar Zaman's aggression at the other end. Give him time and I believe his strike rate will improve as his confidence grows as we witnessed in the 5th ODI against Zimbabwe. Pakistan's newest opening pair not only created individual records, as mentioned above, but also created partnership records during the series against Zimbabwe. Fakhar and Imam added 304 runs for the opening wicket in the 4th ODI, which was only the 4th instance of 300 runs being added for any wicket in ODIs. It was the highest partnership by any Pakistani pair in ODIs breaking Inzamam Ul Haq and Aamer Sohail's 24 year old record partnership of 263 runs against New Zealand. It was the highest ever partnership for the opening wicket in ODIs breaking Sanath Jayasuriya and Upul Tharanga's record of 286 against England in 2006. And it was the 4th highest ever partnership in ODIs. Fakhar and Imam added 704 runs during the series against Zimbabwe, which is a record for most partnership runs by a pair in a bilateral ODI series. They broke the record of 590 runs set by their own countrymen - Imran Farhat and Yasir Hameed - against New Zealand in 2003-04. When non-bilateral series, including World Cups and Multi Nation Tournaments, are considered then Fakhar and Imam's tally behind only Tillekaratne Dilshan's and Upul Tharanga's 800 partnership runs scored during World Cup 2011. It is way too early to consider Fakhar and Imam in the same league as Saeed Anwar and Aamer Sohail, the best opening combination Pakistan has ever had in ODIs. However, they have had a dream run of late and they are well on course to writing their own history down. The similarities are uncanny and I have no doubts that this left handed duo will take Pakistan to great heights. They already have the most century opening partnerships for Pakistan and you can feel it that there are more to come! The third part of this trinity is Babar Azam who till very recently was the best batsman in Pakistan's XI. Now Fakhar is strongly challenging him for that label. Babar has been Pakistan's leading run scorer in ODIs for the past few years, and he showed again why he is one of the world's best with a perfectly timed century in the final ODI against Zimbabwe. That was his 8th ODI hundred in his 44th ODI innings. Only Hashim Amla scored 8 ODI centuries quicker than this, and he managed them in 43 innings. Among all batsmen with at least 5 ODI centuries, Babar Azam has the best frequency of scoring ODI hundreds in the world. His current rate of 5.5 is better than Kohli's and Amla's. And among these batsmen with the highest frequencies, Babar has the second best ODI average, behind only Kohli. He also has one of the best 50-100 conversion ratios - in fact he is the only one with a conversion ratio of over 1. Babar requires another 27 runs to reach 2,000 ODI runs. While he can't break Hashim Amla's record of 40 innings to reach the milestone, he can equal Pakistan's record, which is also the second fastest, held by Zaheer Abbas who got to 2,000 ODI runs in 45 innings. 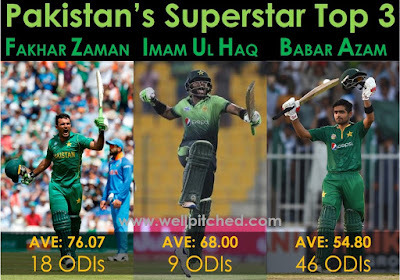 What is fascinating about this Pakistani trinity is that the records set by Fakhar for fastest to 1,000 runs and by Babar for fastest to 8 ODI centuries among Pakistan batsmen can really be broken by their third partner in crime - Imam Ul Haq! He has 544 runs in 9 ODI innings. What is another 456 runs in 8 innings? He has 4 ODI centuries in 9 innings. What is another 4 in another 33-34 innings? Pakistan have found quite a combination here. We all fondly talk about the 90s and the superstar team Pakistan had then. I feel this team is close. Its not there, but Pakistan have not had a better ODI team than this one in this century, and this team has totally shown the potential of being a champion one!